Harrogate Town return to National League action this afternoon (Saturday) after a three-week break. 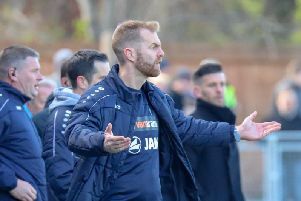 Simon Weaver’s men make the 540-mile round trip to Dover Athletic, their first outing in the league since beating Hartlepool United 3-1 on January 19. They travel to Kent hopeful of coming away with a similar result to the 2-1 FA Trophy success they recorded at the Crabble just last month courtesy of a Jack Muldoon brace. The sides drew 2-2 in the league when they met in Harrogate back in October, Kelvin Langmead salvaging a late point after the Whites had recovered from Aaron Williams' first-half opener to get themselves into a match-winning position. Dover were deep in trouble at that stage of the season, mired in the relegation zone having won only one of their opening 14 fixtures and had just appointed current boss Andy Hessenthaler as manager. They have however improved somewhat under Hessenthaler's stewardship and now sit 19th, though they are without a victory in four matches. Since losing to Town in the Trophy, Athletic have drawn with both Bromley and Havant & Waterlooville before going down 2-1 at home to Gateshead last time out. The Whites' main threat will come in the form of big centre-forward Inih Effiong, who has notched three times against the men from Wetherby Road already in 2018/19 and has eight goals to his name in total. They could however finish the weekend as high as sixth if they take three points and both Sutton United (6th) and Gateshead (7th) fail to win.